Lions are a registered charity who volunteer their time to help, local, national and international people in need. 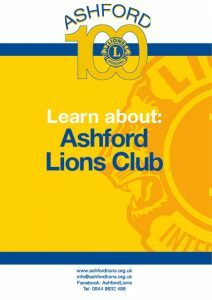 Our local Ashford Lions club started in 2014, with a small group of dedicated members. It continues to run with a small group of regular participants who give their time to support the local community. We are especially proud of our annual Santa’s Sleigh and put on games and activities, like our “Beer Slide” to raise money for our local charities. We also run events like “It’s a Knock Out” to support communities with physical and learning disabilities…and in the process we have a lot of fun. Of course the more people we can bring into our club the more people we can help and the more events we can run. We don’t just need committee members, we also need people who can give us help and support to man stalls and deliver our message. Even volunteering a few hours of your time during the year could significantly expand the amount of good work we can do. If you are interested in supporting your community, this is a real chance to jump in, raise money, and of course have some fun! So, if you want to become a formal member, or if you want to volunteer an hour or 2 of your time, we want to hear from you. Want to know more? There are many ways to contribute to our community and volunteering is certainly one of them. Your interests and ideas are very important when considering serving your community. Also, if you already have a lot on your plate, your time will be limited and Ashford Lions are well aware of balancing commitments. Volunteering under the umbrella of Lions International promises the highest level of service and charity conduct. Lions are an international network of 1.4 million people dedicated to making a difference locally and globally. 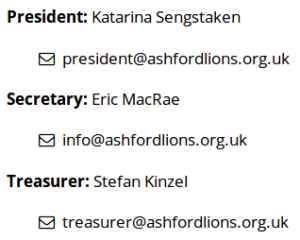 If you are interested in becoming a Lion, contact us to find out about joining, or come along to one of our meetings or events. Yes. Lions Club International was the first service club organization to welcome women as members and women are the single fastest growing segment of Lions since.